Yep, it’s that time of year again. Back to School. It’s often hard to believe how fast the summers fly by. That is why getting those 1st Day of School Pictures is so important. They change so much each year and we want to be sure to capture these moments while we can. From Pre-School through Fifth Grade all your printables are here and available for download. There’s also last day of school printables so you can see how much they’ve grown and changed from the start of the school year to the end of the school year (coming soon…). We also have the matching last day of school printables, so you can track how much they’ve grown from the beginning of the year to the end of year. It can really be surprising to see the difference! What about your tweens and teens? Don’t leave your older kids out. They may not be as enthusiastic, but some day they’ll be glad you took these photos. We even maid the signs a little more grown-up for these tweens and teens. We’d love to see your first day of school photos with our FREE printables. Leave us a note in the comments or email us at sunandhurricanes@gmail.com. We hope everyone has an amazing school year! Don’t forget to come back next year for our FREE first day of school printables. Do you have first day of school signs with 2018-2019 for 6th-12th graders? We didn’t put the year on those signs, we’re sorry. It just made it easier for people to access. Hi! 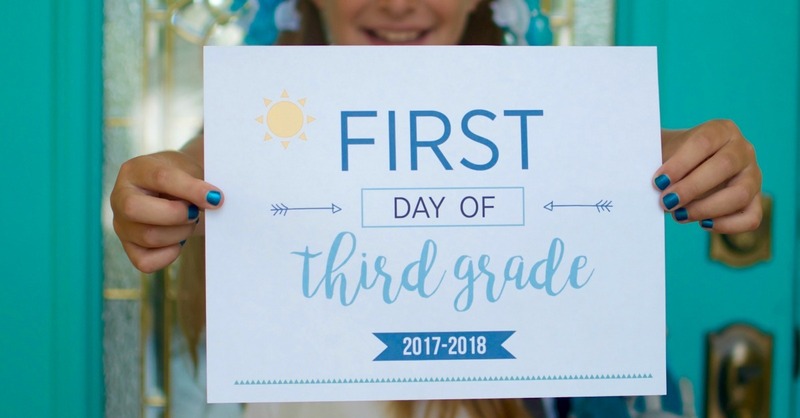 I used your First Day of School Signs at the beginning of the year and would love to have the Last day of school signs if they are available? They are so cute and the kids love them!! Thank you!! These are super cute! I read that you are releasing the matching end of year sign… when will that be available? I would love to print ahead of time so it is ready for the end of year. Thank you so much!! !